If your air conditioner is going to have a refrigerant leak, there’s a good chance it will happen on the indoor coil. Also known as the evaporator coil, this air conditioner component lives inside your HVAC system’s indoor unit. Refrigerant passes through it. Air passes over it. Heat is removed from your home, and you feel great all through August. Until it starts to leak. When you’ve got an indoor coil that’s leaking refrigerant, it will take a long time for the system to cool your home… if it cools your home at all. Even if your AC doesn’t quit right away, you’ll experience longer run times. As the leak worsens, the system will lose its ability to cool. Sadly, repair isn’t an option. There’s no reliable way to repair the leaks themselves. 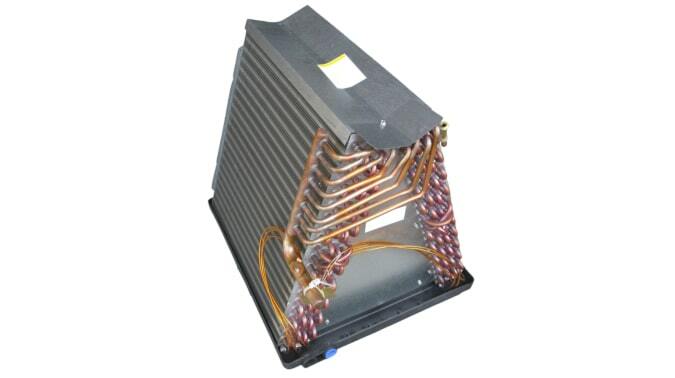 Evaporator coils are large components that reside in dark places and are characterized by tiny dips, curves, crevices, and hard-to-see, hard-to-reach areas. When it comes to finding leaks, the needle-in-a-haystack analogy applies. And keep in mind that you might be dealing with several little leaks, not just one big obvious one. For this reason, you’ll usually have to replace your coil, your air handler, or your entire HVAC system. It all depends on what kind of system you’ve got, how old it is, and your long-term priorities for heating and cooling. You should probably replace your air conditioner. As we’ve explored before, R-22 refrigerant is scarce, expensive, and practically obsolete at this point. While it’s usually possible to replace an evaporator coil in an R-22 system, it’s typically not in your best financial interest. When you’ve got an R-22 system, putting in a new coil is a lot like putting a new transmission in a 1994 Dodge Shadow. It doesn’t make a lot of sense. Consider the evaporator coil leak a sign that it’s time for a new AC. You’ve got more options! Unlike R-22, R-410A is today’s refrigerant and will remain the dominant type for many years to come. So, should you replace the coil alone? It all depends on your warranty. If the coil is still under warranty, replacing just the coil might be the best course of action. However, when the coil is out of warranty, you might have to pay several hundred dollars for a new one – and that doesn’t even include labor. The good news? Your HVAC dealer might be able to get you a new air handler for for around the same price. It could cost a little more or a little less than the new coil, but here’s the the thing: A new air handler usually comes with a 10-year equipment warranty. That’s huge. A new coil, by contrast, only comes with a really short warranty – usually just one year. All in all, the new air handler is a better deal than buying a new coil and having it installed in your existing unit. The 10-year warranty also extends to all parts of the air handler, not just the coil. In general, the same logic applies. You might be able to replace the coil alone, but it could also make more financial sense to replace your entire air conditioner – especially if you’ve got an older R-410A system and were already considering replacement or you want to upgrade to a variable speed HVAC system for improved comfort. But there’s also the question of the furnace. Should you replace it, too? That depends. Is your furnace 15 years old or older? If it is, you should probably just replace it while you’re having the AC or coil replaced. Chances are, you’ll be replacing the furnace very soon one way or the other, and you can save on labor by replacing the whole system at once. If the AC is paired with a furnace that only heats the upstairs, you might want to keep the furnace for now – even if it’s older! A furnace that only heats the upstairs typically lasts longer than a whole-house furnace or downstairs furnace. If it’s not giving you problems, don’t replace it yet. If your furnace isn’t all that old but you’d like to improve comfort, you could use the AC or coil replacement as an opportunity to get a more efficient furnace or a variable speed, two-stage furnace. The best way to decide is to estimate how far in the future you’d be likely to replace your furnace if your AC’s evaporator coil wasn’t leaking. If you think you’ll need to replace the furnace soon, it might make sense to replace it now. Sometimes, replacing a leaky evaporator coil is your best choice. Other times, you should replace your air handler or even your entire system. Your decision depends on what type of system you’ve got today and the level of comfort and efficiency you’d like to enjoy in the future. And if you’re reading this article breathing a sigh of relief that you’ve never had a leaky evaporator coil, know this: It can happen to you. That doesn’t mean it’ll happen this summer, next summer, or the summer after that. But it’s always possible. Now that you know what to do, you can make a confident decision that resolves the problem as quickly as possible.